The Chinese Communist Party’s inclusion of the “Belt and Road Initiative” (BRI) in its constitution last week proves beyond any reasonable doubt that the concept has a central and significant place in China’s foreign policy going forward. At the same time, to those focused on the challenges that Chinese overseas infrastructure development currently faces, the initiative can be viewed as a risky and perhaps even overblown venture. Some analysts have argued that China will be unable to maintain high rates of lending for long, and one American economist has pronounced the program an infrastructure investment “dud.” In order to square this circle, it is important to reconsider Belt and Road as something more than just an infrastructure program. In fact, it is arguably a road map for China’s transition to a new level of economic development, one that also provides us with glimpses of its view for the future of globalization. Looking back at the official “Visions and Actions” white paper, it is clear that BRI was always intended to be a comprehensive vision of Chinese policy from the outset, and not simply an infrastructure connectivity program. The document envisions a plan for linking China’s evolving economic development with that of its Eurasian neighbors, for enhancing people to people and cultural ties, for developing new standards for communications and energy technologies, increasing the ease of cross-border, multi-currency transactions and further internationalizing the use of the renminbi. As much of the world focuses on infrastructure, China seems to have been working diligently on all five “pillars” of BRI: policy coordination; facilities connectivity; unimpeded trade; financial integration; and people-to-people bonds. This is evident in the Belt and Road Forum outcomes, which may be lacking in depth, but not comprehensiveness. China has partnered with the European Union to work on new standards for 5G mobile communications, and has laid the groundwork for renminbi-denominated international financial transactions, creating networks in a space long dominated by American institutions and the U.S. dollar. [T]he Silk Road Spirit – ‘peace and cooperation, openness and inclusiveness, mutual learning and mutual benefit’ […] Symbolizing communication and cooperation between the East and the West, the Silk Road Spirit is a historic and cultural heritage shared by all countries around the world. 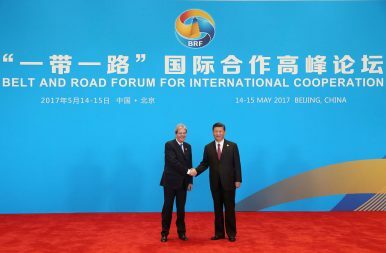 If one reads through enough state media or official speeches on Belt and Road, it becomes apparent that a stylized history of the original Silk Road plays an important role for BRI. By constantly hearkening back to the history of East-West exchange, Chinese outlets seem to be interested in propagating a narrative of a particular kind of globalization in which China had a central and ostensibly benign role. In this old “Silk Road Spirit,” which Xi Jinping seeks to make anew, value-indifferent trade—not politics—drove interconnectedness and the advance of civilization. If BRI’s inward-facing reality is that it is a comprehensive plan for advancing China’s economy to the next stage of development, its outward-facing reality is that it is a comprehensive rebranding of China as the focal point of the next stage of globalization. This pluralistic, “open,” and multicultural order will not have a “leader” like the current iteration of globalization, but it will certainly have a center of gravity. The focus on “mutual learning” and frequent reference to the growth and exchange of “civilizations” in state media on BRI is a topic worthy of further study. At the diplomatic and strategic levels, publicly endorsing BRI may contribute to the legitimation of a particular view of globalization and international order. This carries implications for the future character of trade, financial connectivity, infrastructure-led development and global governance. The overall approach and the rhetoric of BRI consistently seeks to promote a Chinese vision of multipolar global governance, an important element of which is the rejection of prioritizing democratic norms or providing external foundations from which to challenge state sovereignty. As an aspect of China’s continuing inability to allow for a more market-driven economy, BRI also represents and enables a potential shift in leading economic norms. It is of course perfectly natural and expected that China’s signature foreign policy initiative will reflect its broader normative vision for world politics. But prospective partners or BRI supporters must carefully evaluate the degree to which the initiative may bring about revisions to anything from environmental and social safeguards in infrastructure development to internet governance. Such an evaluation must draw on existing studies of BRI’s centrality to China’s long-term economic planning, and an awareness—which should prompt further study—of how the initiative instantiates China’s vision for the future of globalization. Alek Chance, PhD, is a Fellow at The Albert Del Rosario Institute in Manila and an international affairs consultant. His research focus is on U.S.-China relations, international order, and the role of ideas in international politics. This article is adapted from the longer study “Checking in on the Belt and Road Initiative”.